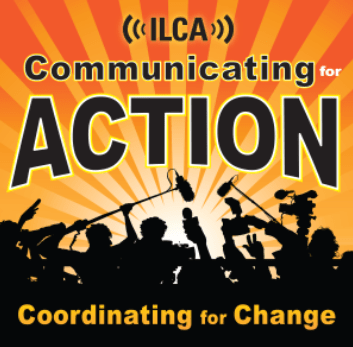 The International Labor Communications Association (ILCA) announced winners in its annual showcase of labor websites, newsletters and multimedia on Wednesday. This local’s website, mediaworkers.org, took several first-place writing awards. A piece by Executive Officer Carl Hall took a first in the “Best Labor History Story” category. Hall wrote about the San Francisco newspaper strike of 1994, in which he was an organizer for the Guild. “Reporter retrospective on 1994 strike” reveals a young journalist’s swash-buckling perspective on a strike that might have lacked focus but was strong in unity (and good food to eat). Against a backdrop of rain-sodden nights, plenty of internal and external heckling, and a ruffian mix of reporters hell-bent on obliterating the “scab paper,” readers are given gritty insight into what makes newspeople tick. A touch of whimsy threads Hall’s account, but he never loses sight of what really matters – the people. His condolent pause to honor the man who lost his life during the strike is but one example of the sobering consequences of corporate greed and attacks on working people. This local is proud to report that one of our Bay News Rising program alums took first place in the “Best Profile” category. In “Surviving poverty in San Francisco: one journalist’s struggle to overcome financial stereotypes,” student Danielle Parenteau gives a glimpse of what it is like living in single-room occupancy hotel with her disabled mother. Making barely $14,000 a year, the two women share a 100-square-foot room in one of the most dangerous neighborhoods in San Francisco. Parenteau’s detached recitation of daily struggles to make a few bucks, deal with layers of bureaucracy to get food and housing assistance, and complete her college coursework help the reader understand why people in poverty go numb after awhile. The post-script to all of this is that Parenteau successfully completed Bay News Rising – our mentorship/training program for college journalism students, got a job reporting for a local news weekly, and finished her studies at San Francisco State University. Earlier this year, Parenteau was accepted into the masters program at the UC Berkeley Graduate School of Journalism – proving, once again, the strength of her determination to succeed. ILCA also gave a first-place writing award to this local in the “Best Internet Series” category. The series, “Fire the owners,” focused on exposing the careening, dysfunctional strategy of Digital First Media (owner of Bay Area News Group) to run its newspapers into the ground. Four writers made a case for taking BANG publications out of the corporate clutches of a hedge-fund and finding a new home with community-minded owners supportive of quality journalism and fair-paying jobs. The series was edited by Administrative Officer Kat Anderson, who also serves as editor of mediaworkers.org. The website, its design and its content also took second- and third-place awards in the ILCA contest. It was re-designed last fall.